A team composed of Dell EMC, Microsoft (NYSE: MSFT) and General Dynamics (NYSE: GD) has received a potential five year, $1 billion contract to build a cloud-based collaboration and unified communications platform for the U.S. Air Force. The General Services Administration’s Federal Acquisition Service awarded the contract as part of the Cloud Hosted Enterprise Services initiative that is a follow-on to the Collaboration Pathfinder system under the service branch’s information technology transformation program launched in 2015, Dell EMC said Wednesday. The companies will work to provide and manage communications, email, data, office productivity, records management and collaboration support to up to 776,000 users across the military branch, U.S. Army Corps of Engineers and the Defense Logistics Agency through the enterprise-as-a-service cloud under the CHES program. “We’re grateful for the Air Force’s continued confidence in Dell EMC and our industry partners to expand and further support its IT modernization efforts,” said Steve Harris, senior vice president and general manager of Dell EMC’s federal business. 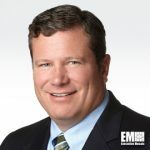 Harris, an inductee into Executive Mosaic’s Wash100 for 2017, added the new contract seeks to build on the Collaboration Pathfinder’s foundation and that the company will work to leverage its experience in consulting, defense and cloud platforms to facilitate enterprise-scale migrations. Dell EMC’s consulting services business will also provide application profiling services and migrate collaboration and communications apps to the Microsoft Office 365 platform.